Northwest of downtown Albuquerque, there is a high school of about 400 students, ranging in ages from 14-20, that is proving Project Based Learning really is for all students. 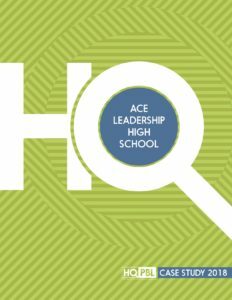 ACE Leadership High School primarily serves students who have already, or seemingly were on their way to, dropping out of high school. On average, students at ACE have been enrolled in three or more high schools and many claim that school wasn’t working for them. Many hold jobs, sometimes even two, and typically come from low socioeconomic backgrounds. The founders of ACE knew that high quality Project Based Learning (HQPBL) was an antithesis to the type of learning experiences these students were used to receiving; instead of trying the same methods with already disengaged and frustrated youth, HQPBL experiences would provide them with intellectual challenge, collaboration, management skills, public presentation skills, tactile feedback and reflection. Perhaps most important to founders of ACE, the approach would provide authentic and meaningful learning experiences. While many aspects of the PBL at ACE are significant, the authenticity and the engagement of students are most notable. Students care about projects they work on at ACE and know that they aren’t just getting feedback from teachers, but from real clients and industry partners. Although addressing each of the learning goals and academic objectives each student needs is a challenge, the team at ACE is committed to providing students rigorous and authentic HQPBL experiences.